Reflective Teaching in Schools 5/ed uniquely provides two levels of support: - practical, evidence-­based guidance on key classroom issues including relationships, behaviour, curriculum planning, teaching strategies and assessment - evidence-­informed principles and concepts to help you continue developing your skills. New to this edition: - 10 Lesson Study Cases illustrate the impact this approach can have on classroom teaching, whether in a city Primary School or rural Secondary Academy - 10 Toolkit Evidence Summaries based on the Sutton Trust-EEF Teaching and Learning Toolkit cover topics like collaborative learning - New Reflective Activities and guidance on Key Readings at the end of each chapter - Updates to reflect recent changes and issues in curriculum and assessment, with illustrations from England, Wales, Scotland and Northern Ireland. 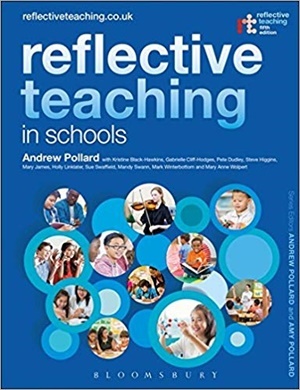 reflectiveteaching.co.uk provides a treasure trove of additional support. It now includes talking heads videos on What is reflective teaching? discussion of societys educational aims, an additional chapter on mentoring, a glossary to help decipher the difference between IEP and LAP, and much more besides.